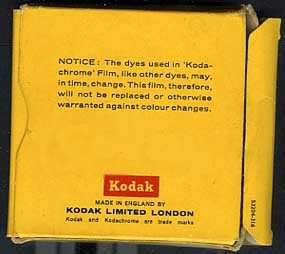 Here is an example of Standard 8mm Kodachrome Film. Note the small frames of picture between each perforation hole. 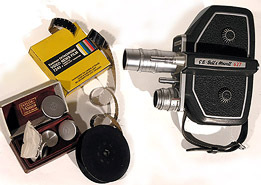 Super 8mm Film for comparison. Note that the perforation hole size has been reduced to improve qualityof the image by increasing the picture area of each frame. 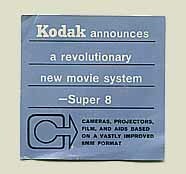 Super 8mm Film with magnetic sound. The wide stripe, shown at left, carries the recorded soundtrack. The very narrow 'Balancing Stripe' is applied next to the perforation holes. This balance stripe was simply to keep the film wound evenly on the reels. The thickness of an unbalanced stripe would otherwise have a cumulative detrimental effect over many turns of film on the reel. www.Ian-Partridge.Com ~ Web page content photography and design ~ Copyright ©2009 - 2017 Ian Partridge.